Can Childhood Falls Create Undiagnosed Health Problems in Your Child? As a concerned parent, you want the best for your child, and no doubt you wonder if your child is as healthy as he or she could be. Several factors determine your child’s overall health, including diet, exercise, proper rest, emotional and spiritual support, and a properly functioning nervous system. A major component for health is the communication between your child’s brain and body. This vital link controls the growth, repair, and function of every tissue and organ. The spinal cord sends messages from the brain throughout the body via billions of nerves. Interference (nerve pressure or irritation) places the body in a state of disharmony. This can lead to decreased immune function and sickness. Starting with the birth process itself, our bodies are subjected to many spinal traumas. Even the most “natural” childbirth can cause stress and strain to the tiny developing spine. This initial damage can be compounded when the child develops proper head support, learns to sit up, to crawl, to stand, and to walk. During this time of rapid spinal growth, these tiny bumps and falls can be the cause of many unexplained health problems. The home is the primary site where the young child receives spinal injuries. A study, conducted by the National Safety Council, discovered that nearly 50% of children fall headfirst from a high place (changing tables, bed, etc.) during their first year of life. Many of the consequences of these falls go undetected. Unfortunately, although immediate symptoms may not be noticeable, spinal health can be compromised. Preschools, daycare centers and other groups are often “breeding grounds” for a variety of childhood diseases. Children with weakened immune function due to undetected and uncorrected spinal injury may suffer from chronic ear infections, asthma, allergies, and other so called “normal” childhood diseases. School is the most common place for accidents to occur for five to eighteen year olds. 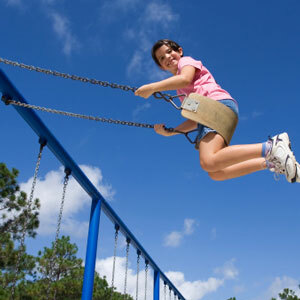 A 1990 study from the U.S. Consumer Product Safety Commissioner revealed that almost a quarter of a million children under the age of 15 were treated for injuries related to playground equipment. The majority of these accidents are falls, and approximately 50% of all falls result in head and neck trauma. Bicycles are also a source of childhood trauma. Over 50,000 children per year are treated for head (not wearing a helmet) and neck trauma. Common childhood activities including surfing, skate boarding, water slides, horseback riding and roller-skating are often associated with falls that can cause pediatric spinal trauma. These types of activities and traumas can cause the spinal vertebrae to lose their normal motion and position. The delicate nerve tissue housed in these bones can be damaged, impairing the brain’s ability to control the associated tissues and organs. Today, many progressive parents are choosing conservative chiropractic care to help maximize their child’s own natural defenses. Parents of children who receive regular chiropractic care often report that their kids seem healthier than other children and that they get fewer colds and other childhood diseases. Children should have regular wellness visits to their Doctor of Chiropractic. With appropriate chiropractic care, spinal problems can be located and corrected, thereby restoring normal spinal and nervous system function. The chiropractic approach to health is safe and natural. For these reasons and more, your chiropractor may be the best doctor to help your child! Parents often feel encouraged because they have a Doctor of Chiropractic as part of their health professional’s network. To discover more information on current health trends, alternative health approaches, and/or information about how chiropractic can help your family, visit the “Children’s Chiropractic Information Center” of Houston at the INNATE CHIROPRACTIC HEALING ARTS CENTER, 230 Westcott St, Ste 220, Houston, TX 77007. To schedule a free consultation with a chiropractic doctor who can address any questions or concerns you might have, call 713-521-2104.